Home › Home and Kitchen › Slate Stone Coasters With Cork Bottom: Wine Glass Chalkboard Coaster Gift Box.. Slate Stone Coasters With Cork Bottom: Wine Glass Chalkboard Coaster Gift Box..
NATURAL SLATE: These 4"x4" square coasters are crafted from all-natural slate, with absolutely no chemical sealers used. Please note that due to the nature of slate, coaster thickness and texture can slightly vary. Each unit is individually crafted, which can lead to small imperfections and differences. 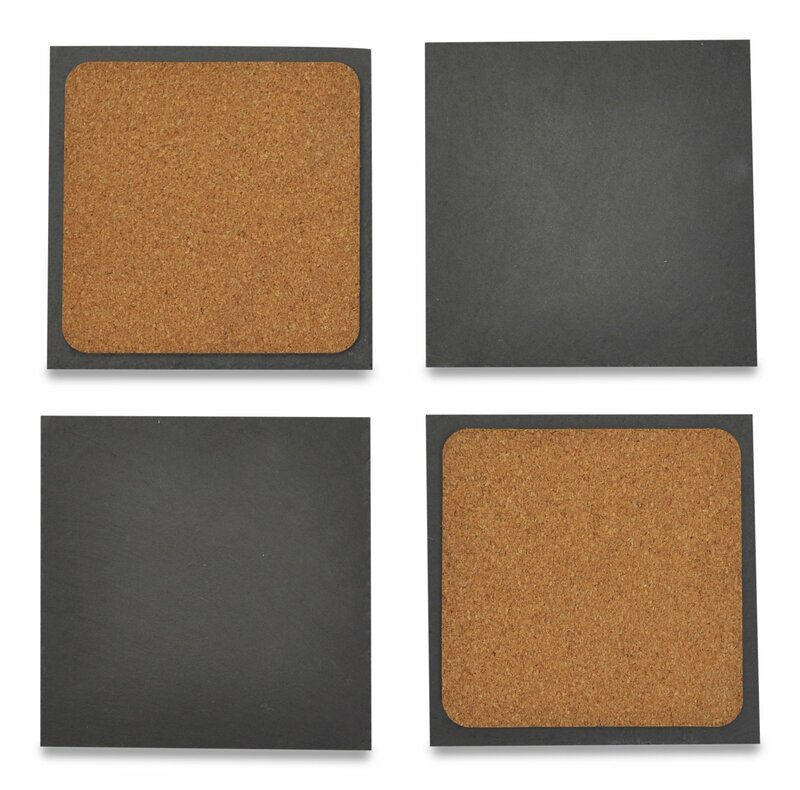 CORK BOTTOM OFFERS EXTRA PROTECTION: No more scratches on furniture from stone coasters! Each coaster has a cork bottom - ensuring that furniture is protected from the slate during use while providing extra absorption. MINI CHALKBOARDS: Use the coaster set as your own mini chalkboards! Write names on the coasters with chalk to keep track of glasses at your next party or create your own design. MAKES AN EXCELLENT GIFT: Jetty Home's slate stone coaster set comes packaged in a modern gift box. It's a great gift to give for any occasion, including for a housewarming, wedding, bridal shower, anniversary and birthday, or as a hostess gift, dining gift, new house gift and wine party gift. SATISFACTION GUARANTEED: If you aren't 100% satisfied with your purchase, we offer a full refund. We are confident in our set and hope you'll continue to use our products. SLATE STONE COASTER SET WITH CORK BOTTOM, SET OF 4 This set includes four all-natural slate coasters packaged in a modern giftbox - making it the perfect hostess gift for any occasion What sets Jetty Home's coasters apart from the others? Quality is always ournumber one priority. Each set is checked to ensure the highest level ofquality for each and every one of our customers. Each coaster also features acork bottom for extra protection and absorption. Additionally, our gift boxmakes this set an excellent gift for any occasion. Please note that due to the nature of slate, coaster thickness and texture canslightly vary. Each unit is individually crafted, which can lead to smallimperfections and differences. To maintain coasters, please wipe excess liquid after use. Do not soak or putin dishwasher. Jetty Home strives to make all of our customers 100% happy. Not satisfied withyour purchase? We will refund 100% of your money - no question asked. We wantto make you a lifelong customer, so we guarantee quality and service. Have aquestion? Just message us!